Voice restaurant in Houston recently hosted a dinner featuring wines from the Peju Province Winery. The major draw for this dinner was, frankly, the price. A 5-course dinner at the highly regarded Voice restaurant at the Hotel Icon, with wine pairings by the Napa Valley (Rutherford Appellation) boutique winery Peju, all for $85? After many conversations with my foodie friends I can state confidently that the days of instantly attending the one-off, triple-digit-price tasting dinners are over for now. The exception being something truly spectacular — a visit by the likes of Thomas Keller or Gordon Ramsay might qualify, or possibly something tied to a charity event. But that doesn’t mean $200+ dinner events will go away. There’s still plenty of demand from Houstonians with money to burn (and there are plenty of those), just not from the food blogger/foodie crowd I run with. There are just too many events to choose from and too many great dinners out there for well under $100. Plus all this eating is packing on the pounds. No need to be fat and poor. O.K., rant over. Bottom line, the price point for this dinner was just right. On to the food and wine! First course. 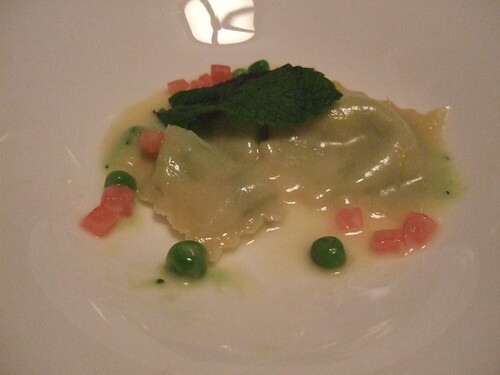 English pea and mascarpone ravioli with mint, tomato, and lemon. Superbly conceived dish. Flavor combination extraordinary. Simple yet complex. More than the sum of the parts. The standout here was the lemon/citrus/butter sauce. It’s hard to pull off just the right balance between the acidity of the citrus and the richness of the butter. This was perfectly executed. The dish was paired nicely with a Peju 2008 Sauvignon Blanc. The wine was bright and crisp, heavy on the citrus notes. My dining companion, @javapeg, took some time to evaluate and eventually came up with strong grapefruit, passion fruit, and pineapple notes. Reviewing the winemaker’s tasting notes after the fact, flavors of passion fruit and pineapple are prominently noted. Nailed it! Second course. 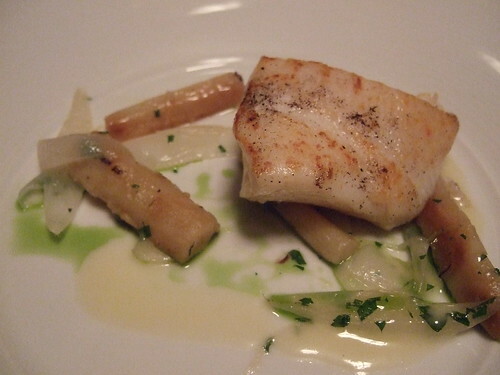 Alaskan halibut with spring onions, caramelized salsify, and truffle butter. This was one of the best worst dishes I’ve ever had. Let me explain. Yes, it was the worst dish of the evening. Nothing about it “popped.” Generally underseasoned and bland. Flavors of the accompanying onions and salsify were M.I.A. And truffle butter? Sorry, didn’t taste any truffle. Why? I imagine Chef Michael Kramer struggled with how to balance the pungency of the truffle with the mildness of the halibut. He may have pulled his punches a bit too much on the truffle part. Fortunately, the halibut itself was perfectly cooked and perfectly fresh with a nice salt and pepper crust. Tender, flakey, savory, and steaming. Would I like Chef Kramer to make a version of this dish with a larger portion of halibut in a simple beurre blanc or meuniere sauce? Yes, please! This dish was paired with a Peju 2005 Merlot. When the wine was poured, @javapeg and I sniffed and sipped and wrinkled our collective brows. Damn, that’s a big Merlot. Whatever. We dug into the fish and sipped what was left of the Sauvignon Blanc. Some moments later our host, Lisa Peju, courageously stood up and announced there had been a mistake. The 2005 Cabernet Sauvignon meant for the next course had been mistakenly poured for this course! Whaaaaa? It was an excusable mistake I suppose. All of the red wine labels for the evening were virtually identical except for the varietal in small letters. The Peju 2005 Cabernet Sauvignon itself was excellent, if not a bit pricey at $50 retail. My still-developing wine evaluation skills immediately noted a smoky, charcoal-y aroma and flavor. @javapeg refined that by noting chocolate and cocoa. After the fact review of the tasting notes mention chocolate, cocoa, and tobacco. Nailed it again! Lisa announced that they were going with the flow and would serve the 2005 Merlot with the next course (this was the wine originally paired with the halibut). And it turned out surprisingly well. Third course. 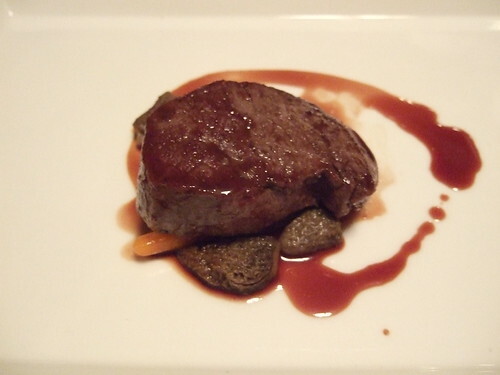 Coriander scented venison (sous-vide) with young carrots, morels, and sour cherries. Excellent dish. Again the flavor combinations reveal a chef at the top of his game. The venison was tender and not gamey, with what appeared to be a quick sear after the sous-vide to add some complexity of flavor. The musky morels added a nice complement to the meat (yes, morels are visually freaky). The cherry sauce added a nice sweet/sour dimension. The preparation of the baby carrots, often taken for granted by many chefs, was spot on. The wine poured for this course was in fact the 2005 Merlot. I asked to see the label. And it worked perfectly with the venison, much better than the Cab actually. Tasting notes mention cherries, cocoa, and cranberries. This pairing worked so well that @javapeg and I wondered if the wine pouring snafu may have been one of those “made a mistake on purpose” type deals. Made for good convo anyway. Fourth course. Braised beef cheeks with shallots, fingerlings, and braising juices. This was the best dish of the evening. After explaining to one of our dining companions about which cheek this meat comes from (the cow head), I cut off a piece with my fork (no knife needed) and tasted. It was as tender, flavorful, and rich as you would expect beef cheek to be. The shallots and potatoes all worked well soaking in the braising liquid. A sprinking of microgreens, often assumed by diners to be inedible garnish (damn you parsley! ), added a surprising note of tangy pepper to the dish. A Peju 2006 Cabernet Franc was poured with this dish. As a stand-alone wine it’s maybe not something I’d drink regularly. But the spicy/peppery flavors went well with the beef and braising liquid. Fifth course. 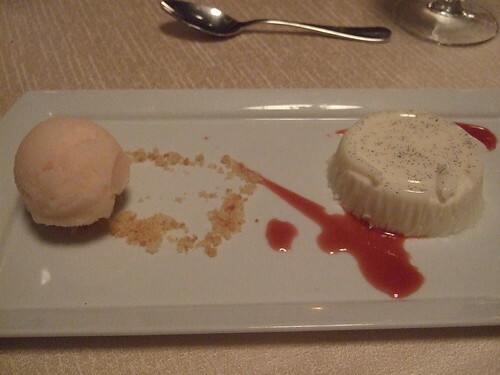 Vanilla panna cotta with grapefruit sorbet and pomegranate coulis. A nice dessert course. The vanilla panna cotta was rich with a creamy/gelatin-y texture and crushed vanilla beans on top. The strong flavor of the grapefruit sorbet, although a refreshing palate cleanser, was jarring side-by-side with the panna cotta. A peach or mango sorbet may have worked better. The dessert wine was a non-Peju Naughty Sticky wine from Naughty Cellars. It was chosen by Voice. It had a deep golden color, almost like apple juice. The staff made a full pour in a regular wine glass. Hello! Alas, the wine was sub-par in my opinion. Some notes about everything else. Host Lisa Peju, daughter of the winemakers, was charming and accessible. She sat down and visited every table, answering questions (Peju is French-Basque by the way). The dinner took place in a private dining room on a mezzanine level overlooking the main dining room and bar area, separated by glass. As a reformed architect myself, I know how much designers love mezzanines. They look great in section drawings. But they often have a significant flaw — a low ceiling height resulting in a claustrophobic effect. Combine that with giant round tables seating 10 people and the space seemed crowded. More than once I peaked out to the main dining room with its soaring, airy, and well-lit space and wished I were dining out there. I love the 10-to-a-table seating arrangement for dinners like this. Our dining companions were friendly and fun. Most of them found out about the dinner because had visited the Peju winery in Napa and had signed up for the mailing list. Service was O.K., with the wine snafu already mentioned. I think the staff sometimes struggled with the close quarters. Strangely, the service tradition of serving women first was completely disregarded. Dishes were delivered randomly. At least once during the dinner everyone at the table was served except one person. We all thought that person had made a special order so we waited to eat. But no, it just took a few extra minutes for the last dish to arrive. At the end of the dinner Chef Michael Kramer came out and visited with every table. That’s always classy. I had never tasted a Peju wine before this dinner. All of their wines served for this dinner were notable. Any future visit to Napa will definitely include a visit to the Peju Province Winery. All in all a wonderful dinner, especially for the price. The service and space issues were minor, at least for me. Voice is a restaurant with a considerable reputation not just in Houston but also in Texas and the US. It lived up to its reputation. NB. On the same day this write-up was posted my good friend ytee posted his review of Voice. An excellent read. This entry was posted in Blog Only, Food, Restaurant Reviews and tagged michael kramer, peju, voice restaurant, wine. Bookmark the permalink. Your descriptions and pictures are great, I feel like I can taste the food. Thanks for sharing…. Great writeup. Spot on regarding the value, and I think you described the essence of the flaw in the halibut perfectly. I’ll disagree on the dessert, I thought the grapefruit was a great counterpoint that accentuated the vanilla and light sweetness of the panna cotta. The Peju wines were all tasty. I’d buy the Sauv Blanc and the Merlot at their price points, but not the Cab or Cab Franc. If those were $10 less then I’d get them too. The sticky was forgettable. I’m surprised at the service, though. Was Todd (the sommelier) not there, supervising the pouring? Hmm. Forgot to mention…I am consistently amazed and impressed by Peg’s palate. She’s incredible, isn’t she? @Food Princess Must get you to one of these dinners soon. Hopefully our schedules will meet one day! @Peggy I think you are correct that the Chef meant the grapefruit vs. panna cotta elements of the dessert to be a counterpoint. I guess my preference would have been something more complementary, although probably more dull. @Katharine There was a French gentleman who welcomed us, don’t recall his name. After that it was all Lisa Peju’s show, the servers and wine pourers were unobtrusive as they should be. I believe the gent who greeted us was Ludovic, who is the GM?